About The Book: It comes as a brush of the shoulder, a breath, a familiar scent, or perhaps a gentle breeze when everything else is still. These remarkable sensations are all examples of our loved ones communicating to us after they are gone from this life—letting us know they are in a better place, and yet still with us. •How a simple note tied to a balloon proves the incredible power of love to transcend all, following the death of a beloved wife. 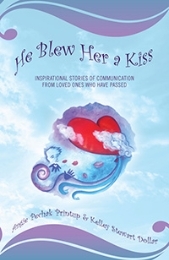 Filled with touching accounts that will make you smile and cry at the same time, He Blew Her a Kiss is required reading for anyone who has ever experienced the loss of a loved one and needs a little help to carry on. My Thoughts: As soon as I came across this book I was instantly intrigued. I have always been fascinated by things like this. The stories that are told in this book are very powerful, you can feel the emotions from the story tellers. There were many times that my arms were covered in goosebumps. I really enjoyed the authors introduction, it was great reading what inspired them to create this book. My family and I have experienced a few of our own experiences ourselves, especially my mother. What awaits us after death is unknown but 'He Blew Her a Kiss' gives you hope and comfort.The idea of this book and the collection of stories was a wonderful idea and I look forward to the second book that is to come in this series. This is a great read for anyone that enjoys stories about spirits and the afterlife. This one definitely sounds interesting. Great review! Thank you Crazy Bookworm for you kind review. We truly appreciate that. Our journey has been a healing one and our purpose is to help others find comfort and healing in their loss. Founder and Co-Author of "He blew Her a Kiss"
Oh, how interesting! I've had a few of those experiences, especially with my mother. Although we had a lot of unfinished business, her "visit" helped with some of it.